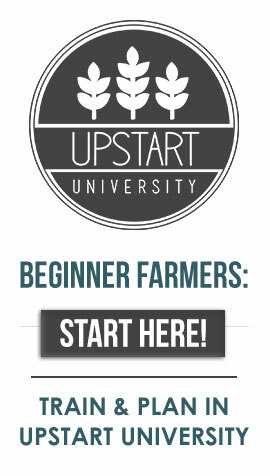 Farmer Brandon Youst from Veg2Bowl (a farm-to-food truck operation) is joining us on the Upstart U blog! Brandon uses the Kratky method (using a stationary solution with no pump) to grow greens for his food truck. In this post, Brandon is going to explain the personal criteria that led him to choose his farming model, how he uses the Kratky model, and the pros and cons of the method. New and aspiring farmers have a lot to consider when making the leap into a commercial farming venture. 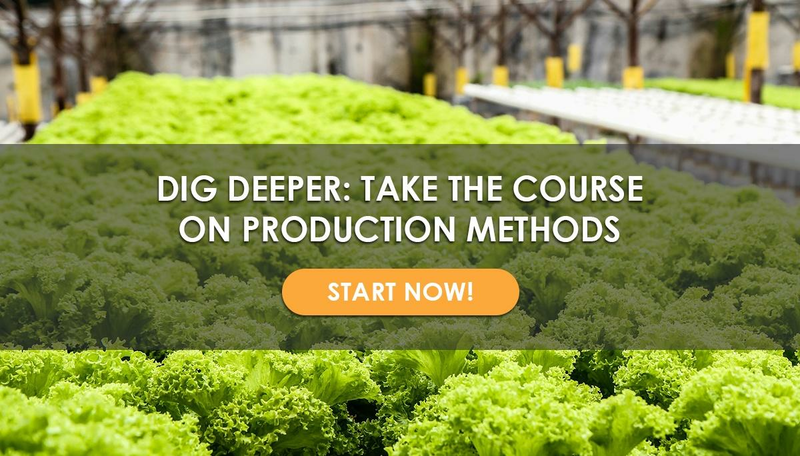 Before they can even begin to grow, they need to decide what to grow and their production technique. Since these choices have to be decided so early in the business creation process, decision paralysis can occur. Aquaponics, hydroponics, or dirt? Rafts, Dutch buckets, NFT, or ZipGrow? If you’re new to commercial farming, it’s quite daunting to know that your approach to your market will affect your profitability. Given these early roadblocks, many never make the leap. I know this because it’s where I nearly found myself. It was a few years back when I was sitting in a cubicle, pondering my future. I knew I wanted out and wanted to become an ‘Urban Farmer’ of some sort, but not much else. I maintained gardens in the past, but that was usually a simple backyard, in-ground approach. When I told myself I’d no longer actively pursue an upward climb in my current career, and I would start my own business, I found myself spending hours each day on the internet consuming everything. The possibilities never seemed to end. After months of research, I was drawn to give aquaponics a try. I built a small system to learn and practice with. It had about 20 goldfish in a 150-gallon tank. Over the course of a few months, I had success growing lettuce & herbs in a very small space. I learned the ins and outs of maintaining a well-balanced ecosystem via constant water testing. This was all great practice. However, as time went on and after visiting a commercial aquaponic training course, the major risks started to show themselves. I saw that one electrical failure can lead to a total crop loss and loss of the fish population. Due to this, the system required constant monitoring. This lifestyle seemed just as restrictive as the job I was already in. Along with the high upfront capital requirements, this forced me to look elsewhere. The more practical solution for my farm was hydroponics. Choosing a grow system from the dozens of techniques and variations just within hydroponics seemed to be an endless rabbit hole in itself. At this point, I knew I didn’t want to make any large investments and I preferred a flexible schedule. I wanted to be able to learn, test my market and see what I actually liked doing without committing myself with to an expensive system. In came the Kratky method. By this time, I had also started to formulate what my business would actually look like. I was thinking of starting a food truck around the same time, so my idea was to combine them both: a ‘farm-to-food truck’ concept. If I was going to be running a farm and a food truck by myself, I’d have to be very careful with time management. What I needed was an easy to learn and easy to maintain hydroponics approach, and that’s what Kratky is. For those of you unfamiliar, the Kratky method (named after B.A. Kratky) is a passive growing method. This means that no pumps or electricity are needed during the growth cycle. A young seedling is placed onto a raft, similar to a standard hydroponic raft (DWC) system. The difference between this and a raft system is that in the Kratky method, the raft sits fixed atop a tank filled with water and nutrient solution which sits stagnant. Throughout the growth cycle, the water level drops as the roots grow, creating a growing ‘air zone’ for the roots. By the time the plant is ready for harvest, the nutrient water is nearly depleted. From here you can just replenish the water & nutrient solution and place fresh transplants on top of the tank. A spray down and vacuuming of the tank is needed after 3–5 cycles. Unlike in recirculating hydroponic systems, Kratky growers calculate the amount of nutrient solution for each tank only once. The solution does not require additional adjustment. To set up the system solution, growers can simply add solution A to a tank filled with water, mix, then add solution B. Place your rafts with transplants on it and you shouldn’t need to touch it again until it’s ready for harvest. Note: If you’re interested in learning the details on raft construction and the proper amount of nutrients, the best source is from the University of Hawaii in the following paper- A Suspended Net-Pot, Non-Circulating Hydroponic Method for Commercial Production of Leafy, Romaine, and Semi-Head Lettuce. As my business grew, all I had to do was build additional rafts. Each 4’x8′ raft fitting up to 60 heads of lettuce can be built in about 20 minutes using a few screws, plastic liner and (4) 2″x6″x8′ pieces of lumber (described in detail in the link above). This gave me peace of mind knowing I didn’t have to commit any significant financial investment to grow a bit bigger. I still could incorporate another grow style should I have the need or want to really ramp up production. I can harvest the lettuce from the rafts in the morning, and by lunch, I can have them prepared into salads & smoothies. Because Kratky has no moving parts, it allows me a disaster-proof assuredness that other hydroponic methods don’t offer. Additionally, I can be away from the farm for hours or days, and I don’t have to worry about technology failing. I’m not confident any other hydroponic approach would work for me in my current situation without the need for additional help. I prefer to run this business as a solo operation, so this also has an effect on the decision to go with Kratky as well. 1) It’s harder to control variables. You need to make sure your source water’s pH and nutrient solution are on target before you fill a tank with it. If you don’t do this, you’ll have to test the EC and pH of each tank individually, and then have to adjust each tank individually. This represents significant labor time! I use a few IBC gallon totes as water storage, which I then test and adjust before using them to fill the tanks. Temperature can also be harder to manage since the water sits in place. I’ve seen Kratky set ups that are up on blocks. Take caution with this approach if using a passive greenhouse as I do, because your plants might not like drastic temperature swings at night. I keep my rafts on the ground, using the earth’s stable temperature to keep the water as consistent as I can. I also utilize roll-up sidewalls for ventilation and shade cloth in the summertime. 2) The bigger you get, the less time efficient it becomes. It’s not too cumbersome to clean out 20 tanks every few months, but cleaning 100 tanks individually would be a tedious waste of time unless you could hire it out and justify the expense of the labor. 3) Little annoyances & inconsistencies will occur. If the ground underneath is not level or the plastic liner is not installed neatly, you will grow an inconsistent product. If the ground is uneven, the starting point of the water level in relation to the raft will be uneven. Too shallow on one end and the roots may not be immersed in the water, and you’ll find a dead seedling a few days later. Too high on the other end and you’ll find higher bottom rotted leaves since the young transplant was then likely over saturated. Also, since the raft sits on top of the tank, you’ll have to make sure a fresh raft doesn’t blow away. I put a brick or rock on each raft to hold it down. 4) Occasional surprises will happen in a passive design. This is just my experience in my location of Eastern North Carolina, but in my passive greenhouse design that works well for Kratky, I find many frogs, grasshoppers, crickets, and spiders are attracted to the raft area. The rafts being low to the ground with open sidewalls, nature finds its way in. This can be seen as good thing, as they are a form of natural pest control, but they can also freak you out a bit when they jump out at you when you’re not expecting it. 5) Covering & quality raft material are essential. You’ll need a greenhouse or some other covering to protect your system from the elements. I’ve mentioned the issues with wind, but you’ll also need to make sure rainwater doesn’t get into the tanks. If the water level increases too much during the growth cycle, you might drown your plants. Regarding raft material: the most cost-efficient and sufficiently durable is 3/4″ thick foam board. I bought 1/2″ and find that it is brittle and warps a bit over time. 1″ thick might be too much as young shallow roots benefit from that initial small air zone, and it’s a bit more expensive. Is Kratky right for you? Those are the drawbacks. Only your situation and goals will determine whether Kratky is a good idea for you. If you are new to hydroponics and want to test it out, I’d say give Kratky a try. If you want to grow way more than you need for family and friends quickly, cheaply and easily, this will also work great for you. If you’re looking to sell a large quantity of a few select items to restaurants and grocery stores, you might find that this is not the most practical solution. Looking for more information on growing techniques? Brandon Youst utilizes Kratky hydroponics for the production of leafy greens for Veg2Bowl and their Farm-to-Food Truck Model in Eastern NC. *This post was originally published in March 2017 and has been edited and updated for republishing. Whar kind of plastic liner is used? Where did you get it? Is it food graded? It should be, to aviid toxic “emissions”, shouldn’t it? If you search Amazon – TRM Manufacturing 610B Weatherall 6 Mil Black Poly Plastic Sheet, 1 Box of 100 Feet Long by 10 Feet Wide, that’s exactly what I use. Since the plastic is covered by the rafts, I don’t see much potential for leeching. It’s decently thick plastic, but I’ve already replaced most of it because I accidentally put holes in it first. So, I haven’t used any of this plastic beyond 2 years, which I would think that is a safe approach to take. Everyones got a different line in the sand, but I can tell you, if I felt this was leeching into my food, I wouldn’t use it. The hydroponic system is really economical and easy way of farming. As a gardener,it is an easy way to grow more in less space. I was cracking up reading this, your experience was the same as mine identical. I settled on the rain gutter grow system Larry Hall uses but working with dirt and gutters is hard. The only thing I’m wondering is how many varieties of food I can grow with kratky? The Kratky systems work best with lettuce, leafy greens, and fast-growing herbs. Fruiting crops, long-term crops, and root vegetables are difficult to do well in a Kratky setup. I have successfully grown Sweet 100 tomatoes using the Kratky method with full grown plants setting fruit in two months from the time of planting the seeds. I use a black rubber maid tub where I drilled holes in the top and made a cage. I have to add 2 gallon of new water solution every week. Do you have any inputs for going vertical with Kratky? In an indoor setup, with lights and everything? Vertical Kratky setups can work, but the biggest consideration is building shelves that are strong enough to support the weight of all the reservoirs when they’re full, the lights, the rafts, etc., in addition to the anticipated weight of full-grown plants. You sell this as a cheap and “set and forget” method, however, in few days the PH starts rising so you need to adjust back to 6.5 every time, so in order to be “set and forget” one should have an expensive PH adjuster. You suggest to use some ammonium sulfate too, but the problem persists. So what is the trick? Is there something I am missing?As far as I know more the plant uptakes the nutrients, more it releases OH ions increasing the ph in any case. Please could you help us in solving this problem? We would like to advocate a succesfully story! KOH raises pH and is very effective at buffering the solution on the alkaline side, so that may be what the problem is. Start with fresh solution and don’t add any KOH. If pH still trends upward too quickly, use phosphoric acid instead of citric. Air pumps address the issue of dissolved oxygen (DO) in a nutrient solution. Drip and ebb-and-flow systems can get a lot of oxygenation from the porosity of the media, and watering is usually intermittent so additional oxygenation is not strictly necessary, however, we do still recommend added aeration. DWC systems have roots completely submerged, which means that it’s much more difficult to get oxygen to the root zone, so it is critical that the nutrient is well oxygenated. NFT systems typically have good DO levels when plants are young, but DO demand will fluctuate as root mass increases. Nutrient solutions can also be oxygenated by adding a venturi to the nutrient pump. Does anyone know what npk ration do i need to grow strawberries in kratky ?